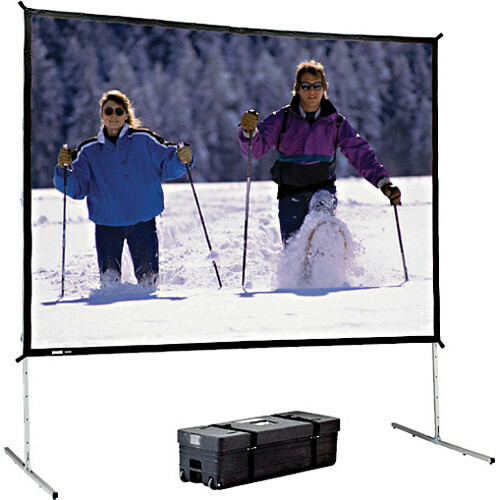 The Dalite 69 x 120" Fast-Fold Deluxe Projection Screen is a quick set-up system for Point-of-Purchase and trade shows. It is also very useful for people who travel much of the time and need a system that they can carry around - either in their car or via airplane. The tab-tensioning feature assures a flat, undistorted image. The back of the screen is designed with additional bracing to promote an even flatness to the screen surface. When this is achieved, the projected image appears more professional leaving less room for your audience to be distracted by a potentially skewed image. Black Frame and Screen Surface ONLY. This version does NOT come with Legs, Case or Cranks. Box Dimensions (LxWxH) 46.0 x 13.0 x 12.0"